One of the newest BB brand on the airsoft market, and sure to be a huge hit. These BB's are as close to a perfect 6.00mm as you can get. Rather than keeping their bb's in a flimsy, hard to handle and reseal bag like other brands, Elite Force BBs come in an easy to handle and easy to store bottle so you don't have to worry about a bag tipping over and making a mess. 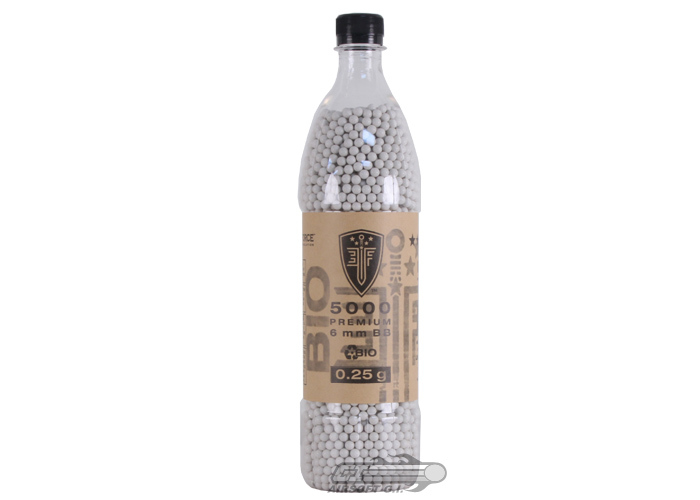 To make them even better, these Biodegradable BBs will even decompose over time in a non-toxic, environmentally friendly way. They are great for extended outdoor operations that require players to use biodegradable BBs. These are amazingly smooth and round BB's. I haven't ever had a problem with them. They are .25 and bio, so they are accurate and are good for the environment.nElite force bb's are the best I have used. They have actually increased my accuracy, and I haven't had a jam! Nothing that I can think of right now, except if you open the bottle in the rain and water gets inside, the bbs get a little gross after a while and start to degrade. So stay under a roof when you're loading your mags. BBs are by far the best I have tested. They are perfectly round and follow very predictable trajectory. Everything about them is really good. They are a bit more expensive but that is understandable due to the nature of the process. It will lower your FPS if you use higher weight BB's but you need to make sure you are shooting within legal limits for your field still. They will be fine as long as the BB itself does not come in contact with dirt or water.